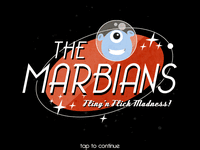 The Marbians is a physics-based interactive game, where players will send Marbians careening off walls and around obstacles to collect moon rocks, rack up points and bonuses, and reach their UFO homes. Smack your Marbian off walls at high speed for more points, collect all the moon rocks you can, and see your alien friends safely home! Post your high scores and trophies to your Facebook page, and check the global rankings for each level to see how you stack up with the rest of the marble-flinging world.